Celebrating 14 years with local farmers and food vendors, since 2004, and also our newly-refreshed look! 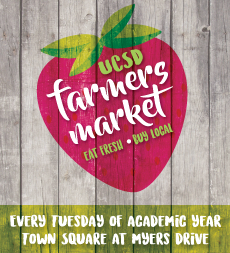 UCSD's Farmers' Market is held every Tuesday from 10 a.m. to 2 p.m. during Fall, Winter, and Spring quarters, at Town Square, between the Student Services Center and the Chancellor's Complex. The Sunshine Market, a convenience store affiliated with the UCSD Bookstore.